Ford stock opened strong Monday on news that China has agreed to lift a 40 percent tariff on US made cars. US President Donald Trump tweeted Sunday that Chinese president Xi Jinping had agreed to scrap the country’s steep import tax on American made vehicles after the two met during the G20 summit in Argentina. Trump didn’t indicate what the new tariff would be. The decision to scale back the tariff comes after China ramped up import tax on American-made goods amid a trade row with the US that began early this year. Trump and Jinping have also agreed to put the trade dispute on hold for 90-days at the summit over the weekend, with the US president later tweeting about his close working relationship with the fellow world leader. The US auto industry was hit hard by the Chinese import tariffs. China not only taxed US-made vehicles more heavily, but scaled back import taxes from 25 percent to 15 percent on vehicles made elsewhere, such as Europe and India, making it harder to compete. Ford stock was trading for $9.78 a share at the time of publication, up 3.88% from market close on Friday. Ford’s sales in China have taken a major hit in recent months, falling 43% year-over-year in September. The extreme dip in sales can be chalked up to the trade dispute the US, along with an aging and uncompetitive product lineup. September also marked the third straight month of declining auto sales in China, which many see as proof that the world’s largest car market is beginning to cool off. 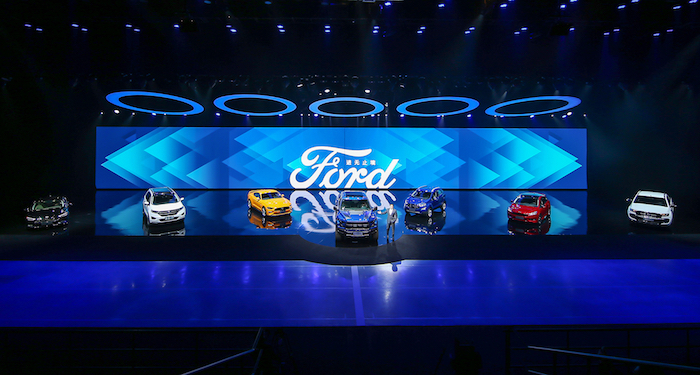 Ford’s full lineup of new vehicles at Go Further in Shanghai. The Blue Oval is planning on rolling out fresh product to boost its Chinese sales in the coming months. The automaker recently launched the Territory in China, a hybrid crossover based on the Yusheng S330, and will soon roll out several other new models to help attract more business to the brand. Ford is also hoping its new-found mobility and autonomous car business will be a big hit in China’s abundant and populous urban city centers.